Some theories of the early universe predict density fluctuations that would have created small "primordial black holes," some of which could be drifting through our galactic neighborhood today and might even be bright sources of gamma rays. Researchers analyzing data from the Fermi Gamma-ray Space Telescope for evidence of nearby primordial black holes have come up empty, but their negative findings still allow them to put an upper limit on the number of these tiny black holes that might be lurking in the vicinity of Earth. "Understanding how many primordial black holes are around today can help us understand the early universe better," said Christian Johnson, a graduate student in physics at UC Santa Cruz who developed an algorithm to search data from Fermi's Large Area Telescope (LAT) for the signatures of primordial black holes. Johnson is a corresponding author of a paper on the findings that has been accepted for publication in the Astrophysical Journal and is available online. Low-mass black holes are expected to emit gamma rays due to Hawking radiation, a theoretical prediction from the work of physicist Stephen Hawking and others. Hawking showed that quantum effects can give rise to particle-antiparticle pairs near the event horizon of a black hole, allowing one of the particles to fall into the black hole and the other to escape. The result is that the black hole emits radiation and loses mass. A small black hole that isn't absorbing enough from its environment to offset the losses from Hawking radiation will steadily lose mass and eventually evaporate entirely. The smaller it gets, the brighter it "burns," emitting more and more Hawking radiation before exploding in a final cataclysm. Previous searches for primordial black holes using ground-based gamma-ray observatories have looked for these brief explosions, but Fermi should be able to detect the "burn phase" occurring over a period of several years. A limitation of the Fermi search was that it could only extend a relatively short distance from Earth (a small fraction of the distance to the nearest star). The advantage of looking nearby, however, is that primordial black holes could be distinguished from other sources of gamma rays by their movement on the sky. "It's like looking at the sky at night and trying to decide if something is an airplane or a star," Johnson explained. "If it's an airplane, it will move, and if it's a star it will stay put." Any primordial black holes still around today would have started out much larger and have been gradually losing mass for billions of years. 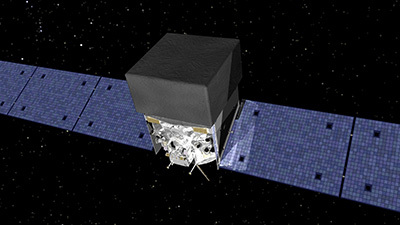 To detect one with Fermi, it would have to have reached the final burn phase during the roughly four-year observation period of the study. Over a period of a few years, it would go from undetectably dim to extremely bright, and would burn brightly for several years before exploding, Johnson said. "Even though we didn't detect any, the non-detection sets a limit on the rate of explosions and gives us better constraints than previous research," he said. In addition to Johnson, the other corresponding authors of the paper include Steven Ritz, professor of physics and director of the Santa Cruz Institute of Particle Physics at UCSC; and Stefan Funk and Dmitry Malyshev at the Erlangen Centre for Astroparticle Physics in Germany. Other members of the Fermi-LAT Collaboration also contributed to this work and are coauthors of the paper.